How does alcohol affect your workout? 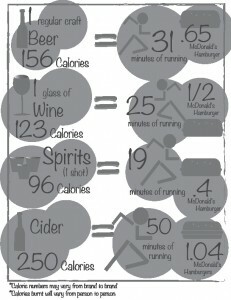 Ever wondered how many calories are in your beverage of choice? 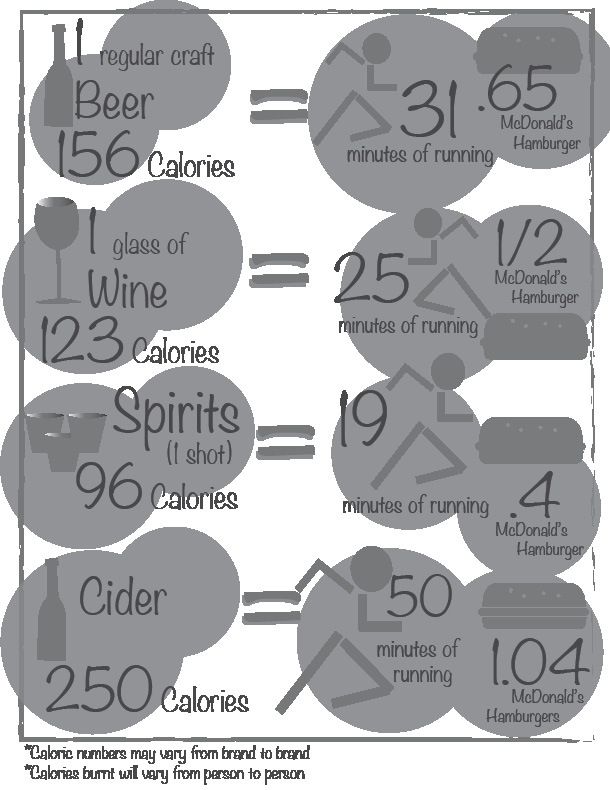 We found out how much running it would take to burn off certain brews, and compared them to McDonald’s burgers for good measure. In western culture it’s a custom to drink as we celebrate. We do it as journalists after we’ve just produced a paper at the end of each cycle, and we do it as university students each weekend to celebrate that we just got through another strenuous week of schoolwork. The older generation is always warning us about the risks of drinking and we all nod along as if we actually believe they never drank a drop of alcohol themselves. But, after a couple of years into university, we sense that maybe, they might just be right. Maybe we should start being more conscious about what we put into our bodies and how it is affecting us. After a big night of drinking, it’s hard not to focus on what happens to our bodies. In order to counter-act all the beers, and let’s be honest here all those bottles of wine, we work out. But we shouldn’t only be aware of what we do after drinking, but also about what we do before we start drinking. If you think you are being smart by working out before a night of partying, stop what you’re doing and put down the weights. The reason for this? Alcohol interferes with the recovery of your body after working out. It causes dehydration and decreases your energy. After a long gym session your muscles need time to repair themselves. Alcohol also decreases blood flow to the muscles, slowing down the recovery process. Not only does alcohol affect the way muscles recover, but it also decreases the secretion of the human growth hormone, eliminating all the work you’ve just done at the gym. Not to mention, the more dehydrated you are, the more hung-over you will be. To make that hangover even worse, your muscles will take longer to repair – making you sore for much longer. Alcohol is not a nutrient, so it cannot be stored as energy in your muscles instead it’ll be stored as fat. It takes about 3,500 calories to gain one pound according to Dave Butler’s beer blog on Fermentedly Challenged. So, in reality, it’s okay to have a beer once in a while, just not right after working out.